Looking back, the 90s had some strange gaming quirks that haven’t quite translated out of that decade. The one that matters here is how “the strength of its fighting games” ended up on the list of what defined a successful console. Certainly since the 16-bit era, the quality of a console’s sports lineup has remained a deciding factor, but rarely another entire genre – and certainly not the 2D fighter anymore. So while Internet jabber to the effect that the Jag’s failure can be attributed in part to weak Mortal Kombat clones may not make sense to you now, this was a big deal back then. It’s got the requisite backgrounds, the blood, and the batshit moves. When it became clear that Kasumi Ninja wasn’t going to pick up the tab, hopes fell to Ultra Vortek. And if you’ve never heard of Ultra Vortek, I wouldn’t be surprised. 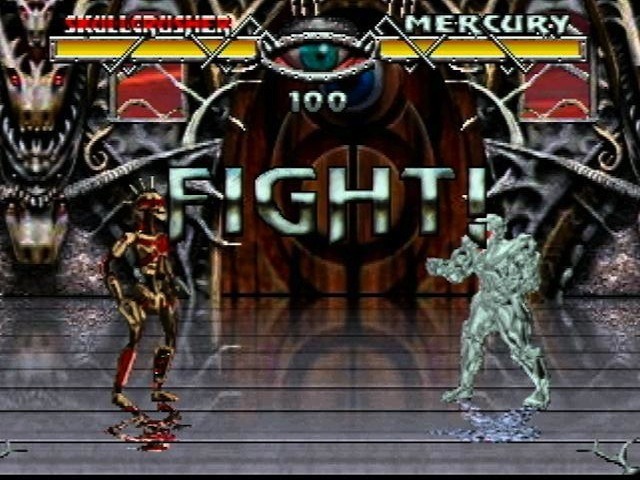 It did nothing to surpass the endless 2D clones of the period, and couldn’t touch MK or Street Fighter. But you may be surprised because it’s the Jag’s best fighter, and an pretty effective attempt for any system. Vortek puts some effort into its tale and character backstories. Essentially, a tablet is discovered in future Earth that teaches of a universal power called the Ultra Vortek (like The Force in Star Wars). The tablet is written by The Guardian – an ancient being who has tested and destroyed every great civilization from Earth’s past. He returns and instructs various factions of Earth to send their best warriors to challenge him – win and ultimate power is yours. Lose, and Earth gets returned to the Vortek and destroyed. Future Earth, and your characters, are divided into three basic factions: humans, robots, and genetic mutants, and a dystopian, cyberpunk backstory gives each of them excellent reasons to fight the others. The character backgrounds and affiliations also define their various special moves. Robots use mechanical appendages to unintended effect, mutants exploit whatever powers they have developed, and humans use their limited knowledge of Ultra Vortek to channel powers of nature, like lighting and fire. Controls are easy to pick up, using a 3-button system focused on attack strength over ordering specific high/low attacks. C jabs, B kicks, and A can be rapidly tapped to do a left-right high punch combo (as in MK). It’s important to note that each character’s attack – even their basic attacks – vary slightly from player to player. There’s no direct and balanced table of this, but some characters can’t leg sweep, some have longer jump kicks, many target their default B kick at different heights. Special moves fall into the expected categories: high and low projectiles, rushing attacks, and teleports. They are triggered with the standard joypad rotators and direction combos, and require the standard amount of skill to pull off. Speed isn’t quite up to Street Fighter standards, but is certainly comparable to the Kombat. The relatively elaborate backstory frees the designers to invent some reasonably creative characters with some reasonably useful attacks. You have a few that fall into the generic and stereotypical, like the Jamaican named Dreadlock who blows ganja smoke as a special, the robots with razor saws or claws for appendages, or the T-1000-inspired Mercury. But even what you’ve seen already works well here. 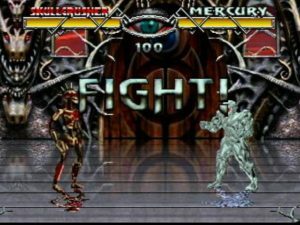 Even though Mercury is a shameless rip-off, its still fun to do his melting specials, morph his hands into weapons, and watch little pieces of him pool and jiggle on the floor as he gets hit. Add to this some reasonably creative and slightly comical fatalities (called Annihilations here), background fatalities, and the comedic Poopalities. Yes, Poopalities. A finishing move involving poop. 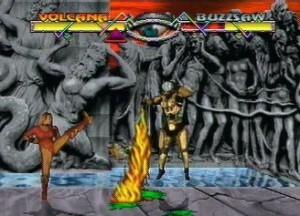 The tournament plays through about twelve battles. 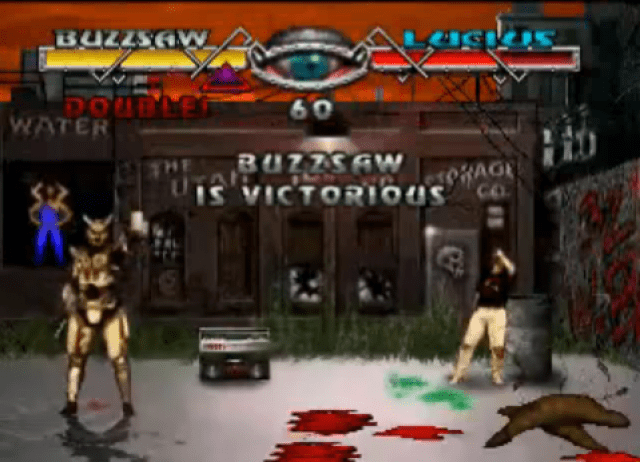 You’ll first take on all eight combatants, including your own character. 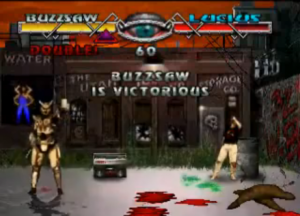 You’ll then have three endurance matches where you fight two characters on one life bar. In an attempt to get the most mileage out of the characters without blatantly seeming to, the characters in these matches will be shadow outlines of the standard ones you just defeated, with no new moves. Finally, you’ll take on the Guardian demon, and get an MK-style victory screen that shows what your character does with their newfound power. AI will provide a strong challenge along the way. There are four difficulty settings that actually do affect the computer’s skill. Normal presents foes that like to turtle up and crouch-block throughout the match, but can easily be defeated with leg sweeps and high kicks. Killer difficulty sends them leaping around in constant motion and pulling off every special in their arsenal with aplomb. Graphics are strong 2D. Human characters are digital captures and play well against the non-humans who are either hand-animated or stop-motion models. Animation for all is pretty fluid, with a wide variety of attacks. Backgrounds are hand-drawn, which is a little less impressive than some of Kasumi Ninja’s gorgeous digital pictures, but still nice and moody, and fit the game well. There’s a typical overuse of the same few “hit” sound effects, but the music distracts you from these well. They’re good rock tunes to fight by. If the Jaguar had done well, or if this game had appeared on other platforms, Ultra Vortek would have had a wider place in history. I suppose that’s the risk of supporting a console that’s too advanced or too unique from the others on the market. It’s certainly not worth getting a Jag for, no matter how much of a fighting game fan you are, but a nice addition to your fighting library if you’re already looking to take the Jaguar plunge. Best fighting game on the Jag. Solid fighter anywhere. Limited character selection, only three buttons to work with.